To craft our guitars, we use a combination of AutoCAD drafting with CNC technologies, as well as old-school craftsmanship. 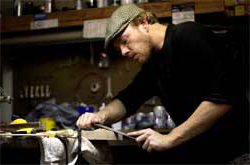 The computerized manufacturing processes are used where the guitars are benefited from the consistency and accuracy inherent therein (fingerboard slotting and inlay work, neck carves, pickup routes and bridge placement), and hand crafting where it matters and will be appreciated by the end user (the contours and carves and the final fit-and-finish of the instrument). We feel that this combination is the best of both worlds as it offers instruments that have the feel of a hand-crafted instrument with the accuracy and consistency of a factory-built guitar. Everyone wins! While not as high-tech as the CNC technology I utilize in my shop, I still feel this is worth noting: My Erlewine-style fret dressing jig. The jig works by clamping the entire guitar down and then simulating the tension of strings tuned to pitch. 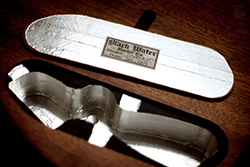 This allows for increased accuracy during the fret dressing process which in turn allows for a much more playable guitar and the added benefit of making it easier to perform the fret leveling process (due to the fact that the guitar/neck isn't sliding all over the place while you're grinding on stainless steel frets). 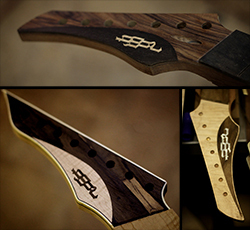 Happy luthier's build better guitars!